Oulton Park Easter British GT tickets available on gate! 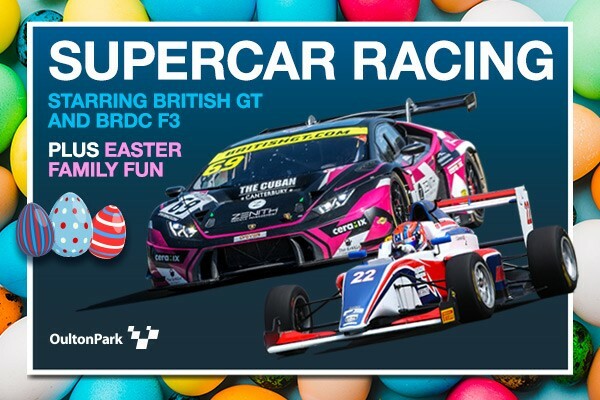 Oulton Park's British GT Easter eggs-travaganza is nearly here, and tickets will be available on the gate for £5 on Friday, £16 on Saturday, and £25 on Monday with FREE entry for under-13s. The hunt for the 2019 British GT Championship officially gets underway at the Cheshire circuit with two races featuring a stunning selection of supercars this weekend (Saturday 20 and Monday 22 April). Machines from Lamborghini, Aston Martin, McLaren, and Porsche will be amongst those in action in a pair of races on the Monday, each featuring pit stops, driver changes, and no doubt plenty of drama. BRDC British F3 will star too, with a multinational line-up of aspiring stars all keen to impress and become the next F1 sensation. There is a precedent for that too, as McLaren's latest F1 racer Lando Norris raced in the series just three years ago. On top of that, there will be an Easter egg hunt, supercar displays, and plenty of additional fun for all the family on the Monday, which is the main event day.